November | 2012 | Novelist, Roman Payne's "Soliloquies"
Comme nous avons des belles choses en France… I was looking for one of my favorite songs on YouTube, and apparently it was removed for copyright violation. By the bye: this is definitely not an advertisement for DailyMotion, I don’t even really like their website to tell you the truth. I just wanted to share it with you in case you can’t find some of your favorite songs on YouTube, you can try this other stupid site, which is, however, less-stupid than YouTube. PS: If the link above does not work, write me an email and I will send you the MP3 to listen to. If my last novel [Rooftop Soliloquy] was about a heroic man who lived the perfect life in a perfect world, and who met no tragic fate at the end but concluded his adventures in happiness—embracing a woman in the moonlight, he delivers a final soliloquy to praise his poetic adventures and the beauty of life—it was because my own life then was so good, my own adventures were so poetic. It was the climax of my life, there was no reason for a tragic flaw. With a belly full of cider and sin. While travelling Ireland from east to west. Life is Not a perpetual climb towards Greatness. and every man after his Aristeia (ἀριστεία). It was one of those delicious nights. In Lamorlaye, I called on M– who gave me lodging in her castle…. 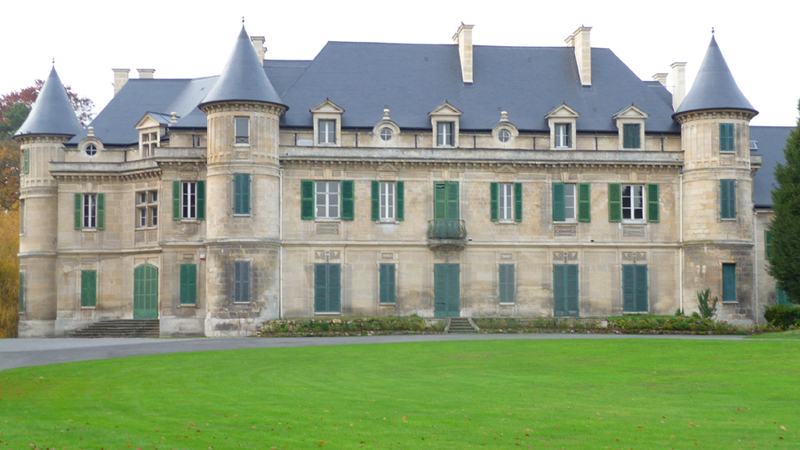 The estate of the illustrious Madame de M–. The servants were asleep by the time I arrived. I asked my hostess for a cup of hot sheep’s milk, she brought me a keg of wine. Ô, did I sleep and dream, last night! Ô, did I feel fine! I dreamt I spied Artemis bathing in her fountain. 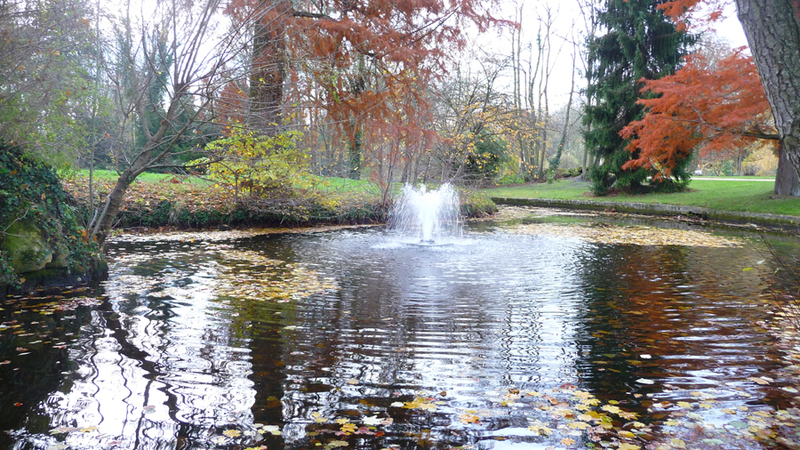 The fountain of Artemis, Le bain de Diane. Figure this: Diane didn’t turn me into a stag; she gave me two kisses, and one more keg! Atlantic coast of Ireland, with soaring cliffs, beaches, waterfalls, and hilly terrain. I will cover 80km-90km of this region per day on bicycle. 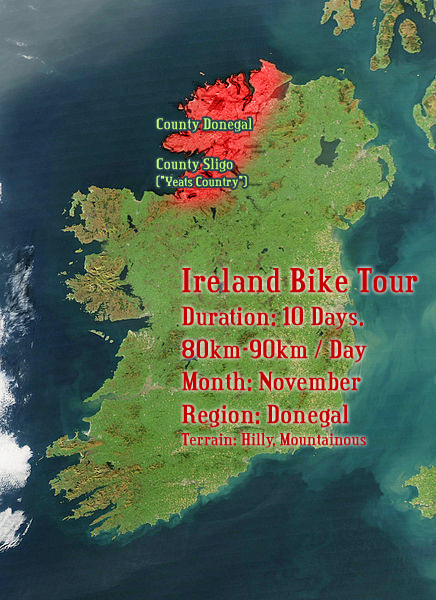 From Sligo, I’ll began a 10-day solo bicycling tour, riding 80km to 90km per day. 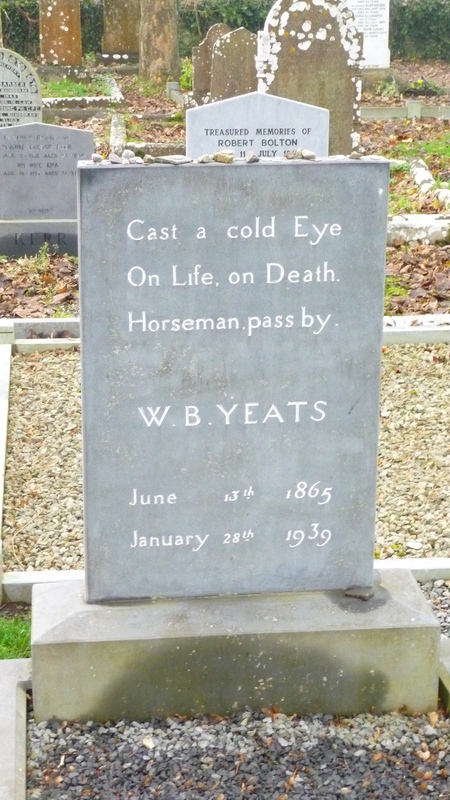 I will stop to take photos, learn about the culture, the history, and literary heritage of this region of Ireland. Each day, after my exertion, I’ll stop at one of the auberges, or beds-and-breakfasts (chosen by the operator of the tour company), and sleep until the first light of dawn. Then, it’s back on the bicycle! I will have ridden close to 1,000km by the end of the tour. Please follow along with my journey by checking back with my blog, my Facebook page, and/or on CulturalBook.com. 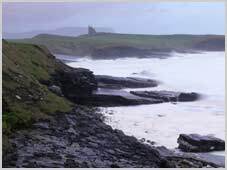 The region I will discover is described as one of the most beautiful, and least explored regions of Ireland. 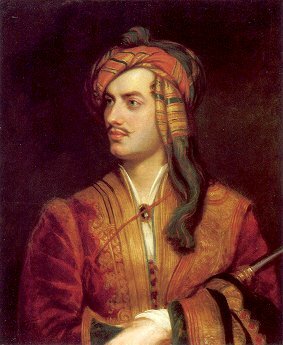 ABOVE: Lord Byron, the heroic literary figure. Could he have received public approval if it weren’t for his club-foot and rumors of his unhappiness? 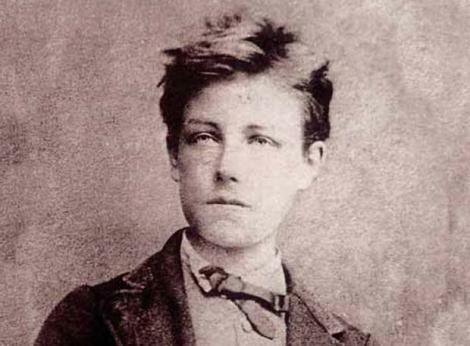 ABOVE: Rimbaud received the gifts of The Muses at a very young age. He was cocky and self-assured. But without his adventures in Africa that cut his life short, would he have received the approval of the reading public? I was quite young then (thirty-two), and the city of Paris was my kingdom. By this time, Paris had opened itself to me like a blossoming flower inviting me to feast of its nectar; the people of Paris were all on my side. I saw no downfall in sight for myself. 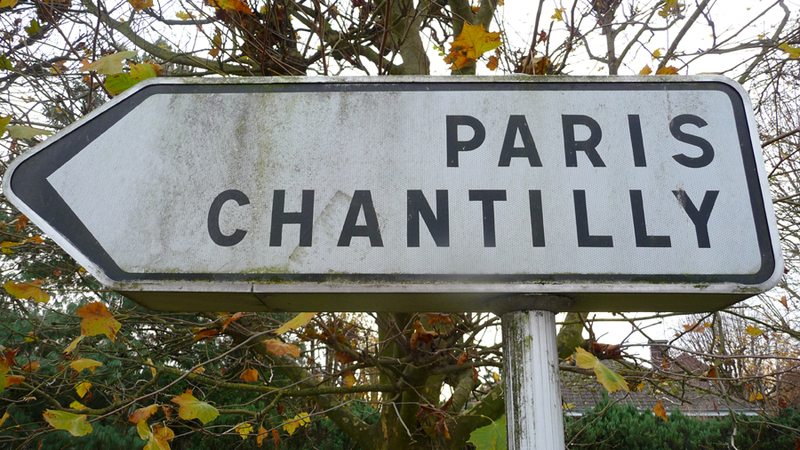 Every street I turned down, in every neighborhood, I would hear: “Ça va, Roman? C’est bien de te voir !” Every sip of air in those years was like a quaff of Helen’s nepenthe—that Homeric drug to enliven, invigorate, to forget all sorrows of the past and see beauty even in moments of wretchedness. So, in the temporary bliss of it all, I eliminated those most common devices of literary narrative: that of the heroic person in a wretched or dangerous world who overcomes through strength and cunning; and that of the flawed person in the good world, who because of his flaw eventually dies or ends up like the biblical Job, on the dung-heap. Other writers in my position would have made “Rooftop” a comedy, ending in marriage and laughter. But my strength is poetic prose. I am a descendant of Racine, not Molière. The comic hero is a buffoon. I wanted to create a Heracles with a harem, and that’s what I did. Some people enjoyed this book immensely. One critic said, while he praised the beauty of the prose, which made it worth reading; he found the main character to lack depth. Is this because I was not yet thirty years-old when I began writing it? I think no… I think it was because I gave the character no real flaws, I didn’t kill him at the end, and all of this was on purpose! Few readers enjoy reading about “the positively good man”—the hero who possesses beauty, good fortune, luck, and an overall enviable life. Some writers who see the world as beautiful, and human-potential as infinite, have tried to express their awe in the presence of life, but they fail to move the reader—unless they give the glory to Nature or to God. Critics approved of Walt Whitmans “Song of Myself,” but they believed he was glorifying either God or “the multitudes” (the “common people”). Whitman was glorifying himself. To express an awe for what you are… not what Nature or God is, but you… A writer who can pull this off deserves a Nobel Prize. But, then again, he or she who can smash cockroaches with a shoe in a pitch-black room deserves a Nobel Prize. The old method, one that Charles Dickens used, was to make the protagonist become heroic through overcoming adversity. Yet what about the writer who doesn’t take Voltaire’s expression of Candide as a joke? “All is perfect in a perfect world!” The heroic soul says, “There is no adversity to overcome!” …at least our hero is above all such adversity (Heracles with no “labours” to undertake). Only poetry can make such a book interesting. Without poetic narrative, any pastoral adventures of Heracles as he drinks red wine from the belly button of a naked nymph, this is rather boring. Dostoevsky’s notes reveal his intense aesthetic conflict over how to write his novel, The Idiot, where he wanted to create “the positively good man,” (“Christ-like,” as he wrote). Yet Dostoevsky knew that in novels, perfect people are uninteresting. One tires of their beauty and success. Dostoevsky pulled-out his hair over the problem of how to make Prince Myshkin likable and still perfect. His solution was to give his hero epilepsy, as well as a naïve simplicity that inspires the other characters to mock him. In Homer, we have Odysseus who is more like a god than a man. But we excite ourselves during his story because he has imperfections and adversity: he hasn’t seen his wife in 20 years. He doesn’t know his own son. And we don’t know if his losing of all his voyage companions is the fault of the gods, or his own fault (after all, the only account we have of Odysseus’ companions dying, is the account he gives to Alcinoos in the first-person. The only time that “monsters” appear and eat Odysseus’ friends, is the time when Odysseus tells the story himself—and Odysseus is one of literature’s greatest liars!). Odysseus has a duplicity that makes him interesting, and the reader doesn’t know if he truly god-like. His humanness is apparent in the end when he isn’t satisfied with domestic life (his reunion with Penelope) enough to stay in Ithica. His wanderer’s nature comes back like an illness, forcing him to take him back out to sea. Poor wanderer! Knut Hamsun is an exquisite example of the innovative writer. Both in Hunger and in Mysteries—his two best novels—he creates “the brilliant hero.” In Hunger, his hero is a genius writer who has no trouble telling the reader he is a genius. The only problem is that the hero can’t afford to feed or lodge himself. In Mysteries, the hero Nagel is also a brilliant man, and has the added quality of being independently rich. His faults lie in depression, suicidal nature, and his inability to obtain the woman of his dreams. Pietros Maneos succeeded with his character of Gabriele (The Italian Pleasures…) despite the fact that Maneos and I share a literary aesthetic vision. Gabriele is handsome, with the physique of a Greek hero, he lives the enviable life of the aristocrat on the Grand Tour. He enjoys women as he fancies them. He is a Romantic and lives like one, but he doesn’t seem to share the flaws of past Byronic heroes. Where Maneos succeeds is, for one, the age of his hero. Gabriele is in his early twenties. Readers kindly excuse the lofty self-importance of youths, knowing that later: “the poor boy will come to realize what the world is really like, and his ego will suffer for it.” World-weary disillusionment isn’t a stranger to Gabriele, who finds himself in a Europe that is not the Europe of antiquity, but a crude fossil, inhospitable to his genius. In “Rooftop,” I wanted to describe our world as a perfect, hospitable setting for my Romantic hero. The need for money, and other crude topics are left-out. Beauty is everywhere, and nothing is as beautiful as my hero and his muses. While writing “Rooftop,” it was easy to believe myself in such a world. Today, after a few personal tragedies, and after losing the microcosm of beauty that was Paris, I see with more and more clarity the crudeness of our world. Thus, I am more and more concerned with the future of my aesthetic style. It is for this reason, (as well as others that I will go into another time), that I haven’t yet finished my novel The Wanderess, which has been in progress for almost four years (four years of literary uncertainty!) If I had lower-standards for this book, I could have finished it after the first year; it would have read like a run-of-the-mill French libertine novel of the 18th Century (which is not at all bad). But I want The Wanderess to take heroism to a new level, and still move the reader to tears of joy. I will certainly fail with the former, as these days, heroism is not my primary literary concern. I am an adventurer who has seen the dark-side of the adventurer’s life and it would be a lie if I didn’t share this with the reader. As for the tears, I can always save my art through the poetry of my prose. While I’ve lost confidence in many of my powers as of late, I retain the power of poetry and a knack for creating plots. The great pre-occupation for me is touching the emotions of the readers: for it is the tears of the reader that water the fruit in the gardens of the gods. Persephone ate of one such fruit, and because of this she can only feel the warm flesh of the sun for part of the year, the other part she is thrown into darkness. Perhaps the literary hero and the literary figure (the writer), must obey such condemnation. The literary hero must die or experience wretchedness to gain the empathy of the reader. Recall that headaches are born of orgies with wine. Remember the sores of syphilis are born of nights of love. With Zeus as my witness, I will perfect a new genre of literary heroism, or die trying. In the meantime, while I tinker in my workshop, I praise my readers and fellow novelists for forgiving my excesses and shortcomings.